It takes a little less than ten minutes of Theatre Ad Infinitum’s remarkable Translunar Paradise, a show focused on death and its impact, to be assured that its creator, George Mann, has developed an intimate understanding of the rhythms of grieving. The programme provides background but you do not need it to know that this devised work was forged in the pain of experience. It captures, and expresses with sublime beauty, a simple truth that is missed time and time again in lesser works: that the true tragedy of death lies not in the moment of loss but in the moment of realisation that life continues relentlessly onwards. A bravura opening sequence sees two masked performers enact the final moments of a long-lasting relationship. We watch actions that have been repeated so often it is as if they have been instilled in the muscle memory of the characters; a pat on the elbow, an offer to carry the suitcase, a crossword clue. These little touches are what remains after a loss and offer a gateway to the past, where the man can relive the key moments in his life and create a way of holding on to what has been lost. In some ways similar to Pixar-film Up, Translunar Paradise begins in tragedy and then expands the scope to explore the impact on the partner left behind. George Mann and Deborah Pugh play the husband and wife, unmasked for flashbacks and masked as the older couple. By inhabiting both parts they imbue the pair with a wonderfully detailed chronology that is played out through repeated mannerisms that acts as visual motifs. 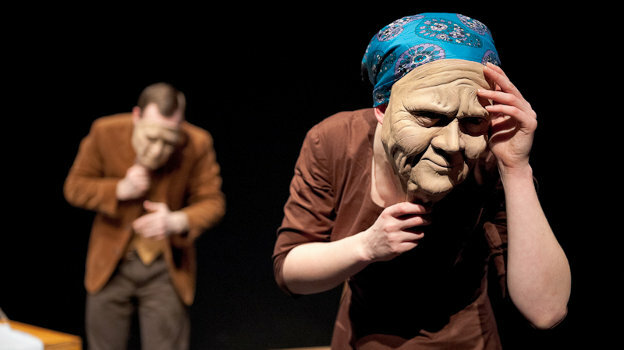 Highly skillful physical actors they bring the masks alive with a striking expressive quality that constantly surprises in its ability to capture the full spectrum of the grieving process on an inanimate mask. In this they are supported by a masterclass from Kim Heron on how to be an integral part of the process, continually on stage and regularly part of the action, without upstaging the characters. Providing a wonderful soundtrack through vocals and an accordion, Heron wrings every last trick out of this most interesting of instruments. A particular highlight is the wonderful sound of rushing wind that accompanies the actors moving back into the masks. A simple technique that acts as a clear aural signifier of changing character, whilst also evoking the slightly ghostly effect of flashing back and forward in memory. The piece lasts for just seventy five minutes but in that time the company pull out one visually stunning setpiece after another. In one, the husband tries to touch the apparition of his wife but with a balletic grace, showcasing the wonderful flexibility that mask work provides, it turns into a labyrinthine dance that has echoes of a tarantella and the drum scene in House of Flying Daggers. Wonderful moments of comedy punctuate the action and the mime of packing a suitcase turns on a sixpence from joy to anger to reconciliation without losing its focus for an instant. It is not a flawless and there is scope, despite its short length, for making it slightly tighter; the value of the scene where the husband goes to war seemed slightly at odds thematically with the rest of the production. However these are minor quibbles in a truly moving piece. The opening and closing scenes are heartbreaking but it is a mark of the success that the final moments are marked with hope. Acceptance has been reached and the slow, painful journey of reconciliation can begin. There are only a number of plays that ably capture universal truths about death; Romeo and Juliet acts as a benchmark for tragic romantic love but its power really rests in the misfortune of circumstance that leads to its conclusion. Sarah Kane’s 4:48 Psychosis will remain a brutally powerful work given the impossibility of separating it from Kane’s own suicide at 28, whilst Joan Littlewood’s Oh! What A Lovely War remains one of the most savage critiques of the futility of war and the impact on the family that has yet been created. Theatre Ad Infinitum may be operating on a smaller scale with Translunar Paradise but in doing so they have created something rather special that packs an emotional punch well above its weight.